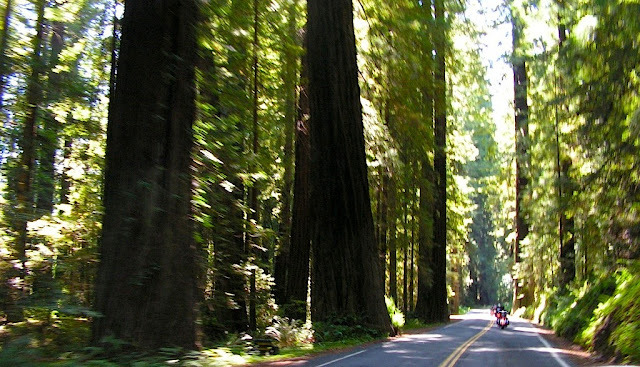 In the last article, I retold my trip to Crescent City for the Rally in the Redwoods, but it really was a story of starts, stops and some observations along the way. Moreover, I hadn't talked much about the impetus for this trip beyond getting to the rally itself. 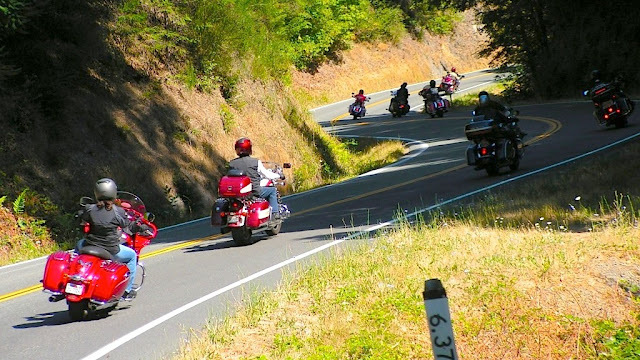 The Rally in the Redwoods was a gathering of KawaNOW, which stands for Kawasaki Nomad Owners Worldwide which includes Kawasaki Nomad, Vaquero and Voyager owners and enthusiasts, who met the week of August 22nd in Crescent City California. While I no longer own a Kawasaki Nomad, I am considered an enthusiast. The organization was founded by Robert "Trip" Hilliard in June of 2007 and has grown to over 2000 members since then. I am am member #19 (it actually was a lower number, but I accidentally deleted my account and had to start over), so you could say I am a founding member. Well, sort of. In the past four plus years that I have been a member of KawaNOW, I have made some friends, lost some and pissed off some, but I have to say overall it has been a very positive experience. I can tell you that having belonged to several online motorcycle organizations, KawaNOW is the only one I can say that has been a place that I haven't felt like I shouldn't belong there. It really is an eclectic mix of personalities that creates an environment where the total experience is greater than the sum of its parts. 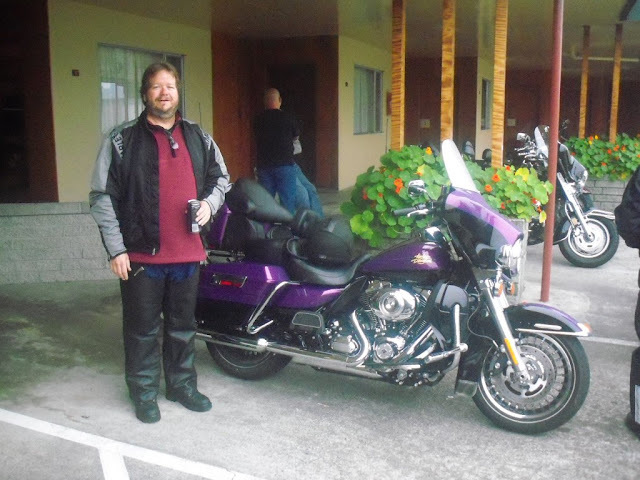 Ross and I arrived in Crescent City, California on that Monday afternoon, after riding up to Crater Lake Oregon earlier in the day. Crescent City is the county seat and only incorporated city of Del Norte County. 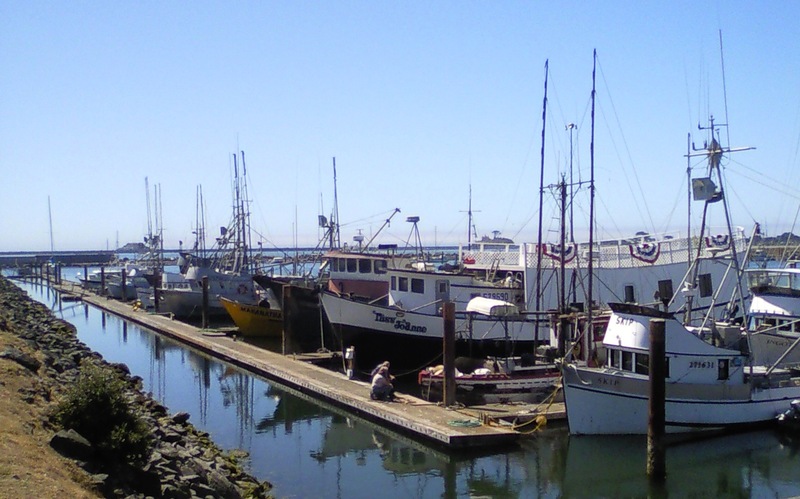 The town of 7600+ residents is a mere 20 miles from the Oregon border and its harbor is home to fishing vessels that bring in the catch. Having grown up on Long Island and lived there until nine years ago, I understand the vibe to some degree. Fishing is a way of life in Crescent City, but the main difference is not having a the largest metropolitan city in the country within a reasonable commute. This means that Crescent City probably has retained its flavor for a long time and there's something to be said for that in a world where change and obsolescence are the norm. Ross and I as well as everyone else at the rally had made reservations at the Curly Redwood Lodge, which was home base. The trouble was, I made the mistake of making them for Tuesday August 23 and not starting Monday August 22. I made the reservations the previous December 7 and I have no idea why I did that. Now that I had no room to stay in as the place had no vacancy that evening, I had to scramble and I was fortunate enough that Ross allowed me to sleep on the floor of his room, which turned out to be interesting, but a little more on that later. The Curly Redwood Lodge is an old school motel with the parking spaces in front of the rooms. There's no refrigerators or microwave ovens and the TVs are CRT type, not modern LCD/LED type screens. There is internet though, and that was a plus as not all motels have internet or decent internet. What is interesting about this motel is that it was made from one curly redwood tree. In 1952, the owner cut down the tree which provided 57,000 board feet of lumber. My understanding is that there is enough left for them to expand. 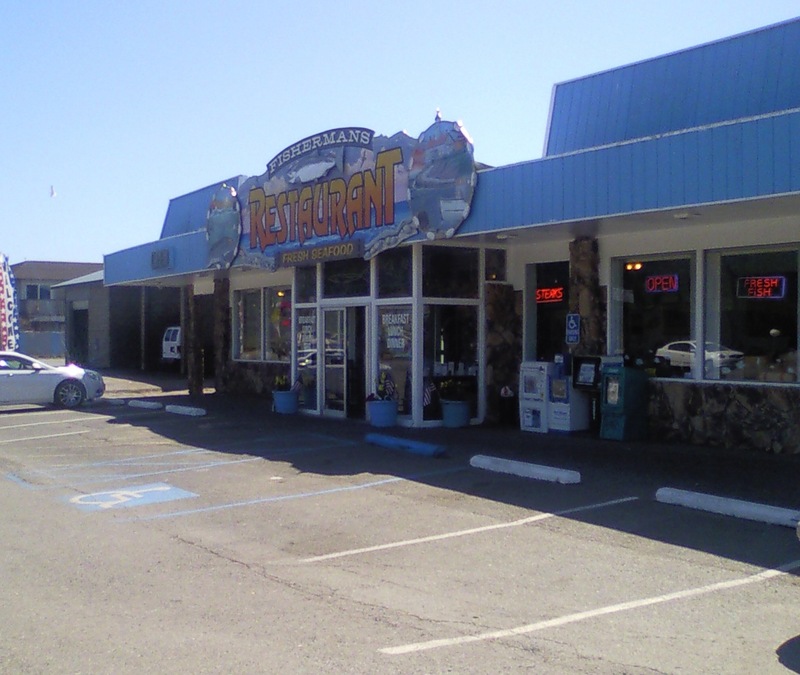 Needless to say, the location is good, with a decent seafood restaurant across the street and the main highway right out front. After squaring things away, it was more of a reunion than a rally, at least for me. Some of the folks I had met at the previous national rally in Custer South Dakota and some I had only known online. It was great to see Brad "Blown Dodge" Langley, Scott "Cactus Jack" Hanks, Richard "Ricky Boy" Cole and Kris "Netnorske" Olsen, who was the rally organizer along with Joel "Waterman" Schneekloth. I also Met Gregg "Schoeney" Schoenkopf and his brother, Kevin "Voyager" Clark, Mark Clark, Tom Hinman and his girlfriend Terrie Gaudette, as well as a host of others. What makes this special is that even though we come from different places, countries, religious and political beliefs, we all share the love of riding motorcycles. I looked forward to this with some anticipation like a family reunion to see the people I'd like to connect with again and make new connections too. I was like a little kid looking out the window to see what relatives pulled up to the house for the party as the Nomads and other motorcycles rolled into the motel parking lot. A big hug from Brad (Brad is just a hug-able type of guy), a checkup with Joel, Noel and Bob to see that they made it safely, and the long awaited appearance of Scott on his "Barney-Davidson". It really is a beautiful Motorcycle and I hoped to see it in person to get the full effect. That night, Ross and I went out to dinner at the restaurant across the street at a restaurant called Fisherman's Restaurant. It would become a regular for me as when I am in strange places for a short time, I like predictability. 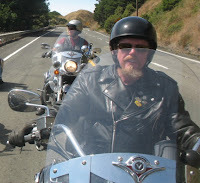 Ross and I hooked up with Teri Conrad, who is a freelance editor, journalist, copywriter, copy editor and photographer who works with Kawasaki's Accelerate Magazine and has her own website, Celebrity Writer. Teri was in town to cover the Rally in the Redwoods and had ridden in on a nice red Vaquero (they are the fastest you know). Ross ordered the Tuna steak, medium rare, while I took the safe route with fish and chips. After my gastronomic roulette with Golden Corral in Twin Falls, I decided to play it safe. Dinner was great and I have to say Teri is a very interesting person, with a lot of diversified life experiences and a lot of fun. After dinner we moseyed back over to the motel, where others were relaxing for the evening after long days of travel in most cases. I procured the necessary bedding from the front desk and setup camp in Ross' suite. Ross and I had a rather long conversation about life, experiences and what's it all about. It was somewhat unexpected but pleasant and useful at the same time. Ross has about 13 years on me and I appreciated his sage advice. The next day, I decided to forego the ride for the day to give my hands, wrists and arms a break. I had picked up some Aleve at a local pharmacy after a number 11 at the Golden Arches, and I hoped the inflammation and pain would go away or at least lessen. I was able to check into my room early, so I just chilled out for the day, catching up on downloading photos, writing and preparing for a radio show that night that I used to produce called The Andre Controversa Show. My plan at this point was to see how I felt the next day and take it from there. I might go on the ride up the Oregon coast or I might not, depending on how I felt. Then I got a call from a friend, Paul Russo. I have known Paul Russo for over 31 years now, having met at a job I got working in a county park for the summery. We were both headed for Nassau Community College and we struck up a friendship that has been ever since. Paul moved to Arcata about 10 years ago and I had told him I was coming out, but he seemed reluctant to see me. Anyway, the call changed that, so on Wednesday, I would be heading down to Arcata, which is about 80 miles south of Crescent City on 101. I really wanted to go on the Oregon ride, but I don't see Paul that often anymore and I didn't know when I would have the chance again. So after another number 11, I headed down 101 for Arcata. Note to self: I should have waiting an hour. I have never in my life experienced such fog as I encountered on 101 that morning. Being able to cut it with a knife doesn't come close to explaining it. Eli Whitney couldn't come up with a machine to get through this stuff and all I could do was get comfortable with the fact that I had to get through it. The road was poorly maintained as well, with attempts to skim coat it with asphalt and the potholes here and there in the first several miles. The other thing was the redwood trees along the road. While not quite as large as they can be in other areas of California, the experience was one of Jurassic proportions. I felt like I was on Isla Sorna and some large beast should come ambling out of the forest to brunch on some prime German machinery with the big Italian on it as a topping. Primeval doesn't come close to describing it. Reality crept in with the evidence on the big trees of contact with motor-vehicles. I can only imagine that mayhem as the Redwoods aren't moving for anyone. As I made way farther south, the fog cleared, the speeds picked up and the road got better. It still took me longer to get down to Arcata than I thought it would, but I was glad to be there and Paul was waiting. The picture above was taken not far from where I picked Paul up. He borrowed the helmet from a roommate that has a Harley Davidson Fat Boy, as I had to give him a ride back to his place. We spent several hours talking about old times, what was happening now and what we hoped for the future. In spite of the years and distance, we connected just as well as we had 31 plus years ago while taking breaks from cutting grass in Eisenhower Park and talking about what the future would be like. Some of it turned out, some of it has not. In the mid to late afternoon, I headed back to Crescent City and I was presented with a "Brake Failure" Light that I had also seen while traversing Crater Lake, instead it didn't go off this time and was on the whole way back to the motel. 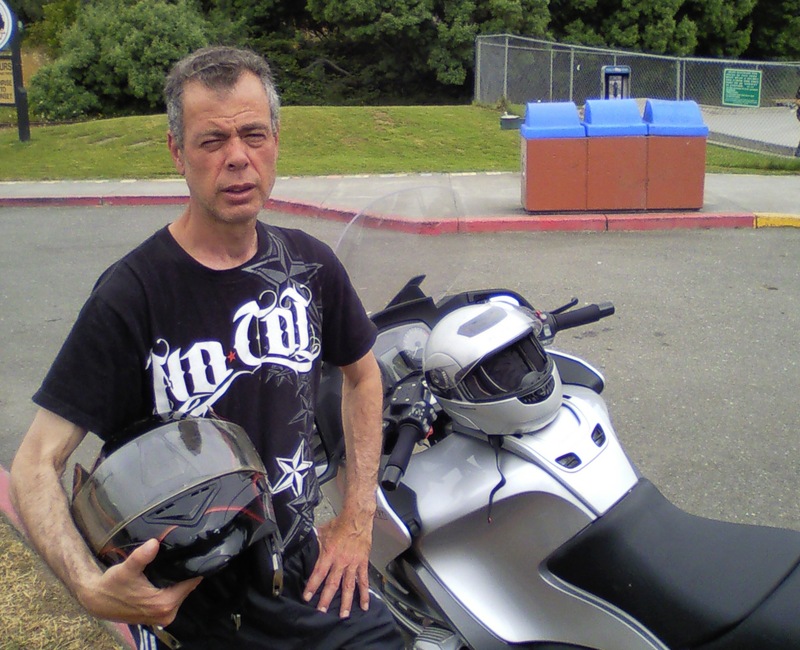 When I got in, I tried calling the BMW dealer in Medford Oregon, which is 112 miles from Crescent City, but no one was there, so I left a voice-mail about my problem. Other than the light being on, the brakes didn't seem quite as affirmative, especially at low speeds. Ross thought that may be there was air in the brakes, so we tried a trick of compressing the break lever with a bungee and left it until morning. After that, Ross, Tom Hinman, his girlfriend Terrie Gaudette, the charming journalist Teri Conrad and I had dinner at the Fisherman's Restaurant. After sufficient victuals, we headed back to the Motel where others were gathered. It is always nice to chat with folks you know from online, connecting the virtual presence with a physical one. It's also nice to catch up with folks that you've met before and I had a nice time catching up with Rick Cole, who hails from British Columbia and meeting Kevin Clark who is from Alberta for the first time. I really enjoy my Canadian brethren and the repartee that evening. It always amazes me that no matter our backgrounds, this common thread pulls us together and runs deeper than one might think on first blush. I am glad to call these people friends. The next day arrived with the same concerns that were there the day before, which was, what was wrong with the bike (not to mention my goofy hands)? It's was an interesting lesson into the stultification of an otherwise logical and linear thinking if not methodical person in myself. I removed the bungee cord and took the bike for a ride. Same deal. 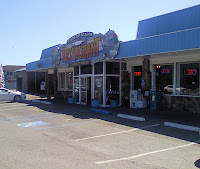 I decided to go to breakfast with Ross and Bob at the Fisherman's where I settled down to a western omelette to get my mind off my problems and get some needed nourishment. While at breakfest, I received a call from Craig Hansen, owner of Hansen's BMW in Medford Oregon. Craig asked several questions to which we came to the conclusion that while the brakes did work, the ABS did not and neither did the partial integral function, which is part of the ABS. Craig advised I check the ABS sensor cable for the front wheel to see if it had come loose and rubbed against the rotor. 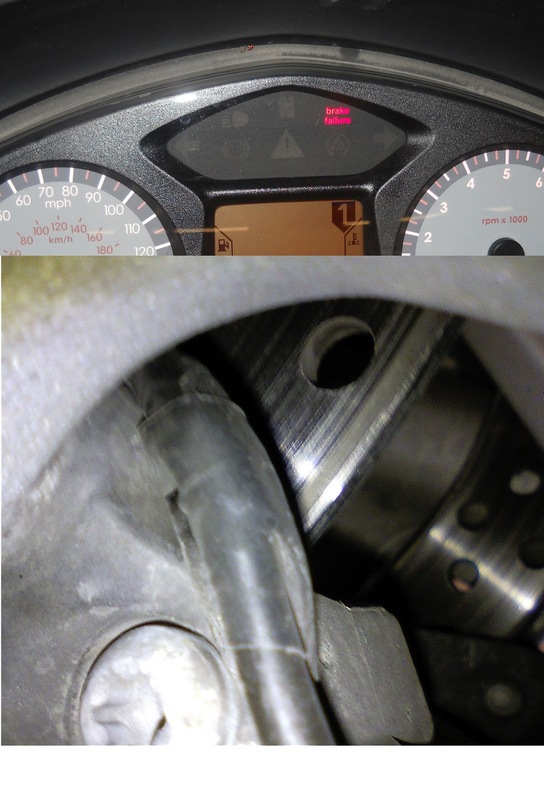 There was a service advisory for this particular problem, which was that the ABS sensor cable wasn't affixed to the left fork properly. If this was the problem, then I should just wrap the cable in electrical tape and re-affix the cable to the fork. He said that if that wasn't the case, to bring the bike in and he would personally work on the bike as his two mechanics were backed up for a week. Breakfast was nearly over at this point so I soon applied myself to the task at hand, which was to see if that cable was in fact worn through as Craig described. Low and behold, it was. I felt foolish as it was so simple (aren't most problems?) and that I had become ignorant to troubleshooting, basic in this instance. 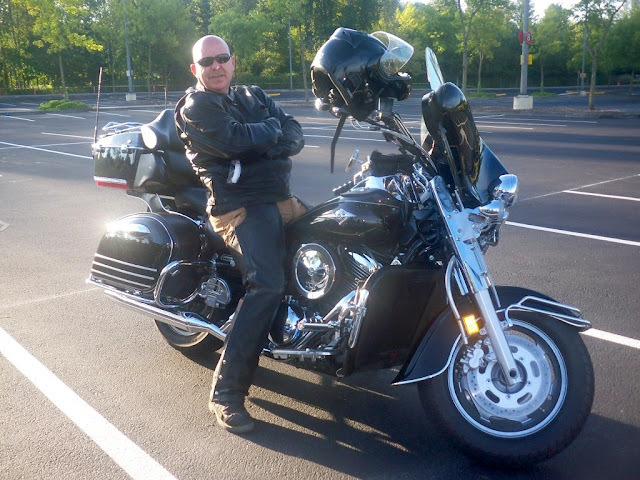 In my defense, it is a new motorcycle and one that is much more complicated than any motorcycle I have owned and probably any that was at the rally, but the thing is, they all do the same thing. In the end, it was a lesson for sure. After procuring electrical tape and a zip tie from Scott (I had everything but those items with me, see Murphy's Law), Ross and I proceeded to fix the cable as prescribed by Craig and I went for a test ride which confirmed the diagnosis and treatment. At this point in the day, Ross and I came to the conclusion that may be we should head back home early and leave that day. I agreed with Ross, as we had a 2000 mile trip ahead of us with four days of travel if we left that Thursday, only three if we left the following day. I felt bad about this as we left early with the last national rally and now missed two of the final night dinners. Joel Schneekloth and Kris Olsen had worked very hard to make this rally possible, which by the way was also a benefit for for the Del Norte Little League of Crescent City. I felt like putting a L on my forehead and compounding this is I didn't even get to go on any of the rides. To quote Robert Burns, "The best laid schemes of mice and men, Go oft awry" and in this case, I really hadn't planned as well as I should have. An epilogue will follow this series and stay turned for Part 3, The Long Ride Home.